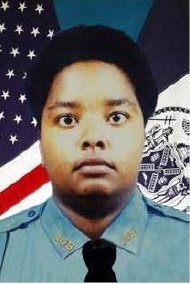 Officer Johnson was shot and killed when two men robbed her while she was off duty. The men then dumped her body alongside the Belt Parkway in Brooklyn. Two suspects were arrested and charged with murder. The shooter was convicted of second degree murder and sentenced to life. He will be eligible for parole in July, 2026. Officer Johnson had been with the agency for two years.